Srinivasa Ramanujan was a famous Indian mathematician. In a lifespan of 32 years, Ramanujan contributed more to mathematics than many other accomplished mathematicians. English mathematician G. H. Hardy, who worked with him for a number of years, described him as a natural mathematical genius. Although he had no formal training in mathematics, he made significant contributions to mathematical analysis, infinite series, continued fractions and the number theory. 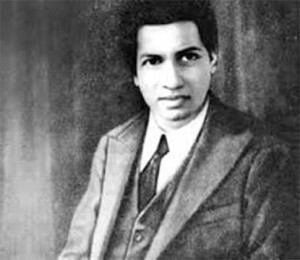 Ramanujan was born on December 22, 1887, in the town of Erode in the South Indian state of Tamilnadu. He was born in an orthodox Hindu Brahmin family. His father’s name was K Srinivasa Iyengar and his mother was Komalatammal. Even at a young age of 10, when mathematics was first introduced to him, Ramanujan had tremendous natural ability. He mastered trigonometry by the time he was 12 years old and developed theorems on his own. By the age of 17, he was conducting his own research in fields such as Bernoulli numbers and the Euler-Mascheroni constant. Ramanujan was a brilliant student, but his obsession with mathematics took a toll on the other subjects and he had to drop out of college as he was unable to get through his college examinations. When he was 16 years old, he got a book entitled A Synopsis of Elementary Results in Pure and Applied Mathematics, which turned his life around. The book was just a compilation of thousands of mathematical facts, published mainly as a study aid for students. The book fascinated Ramanujan and he started working with the mathematical results given in it. With no job and coming from a poor family, life was tough for him and he had to seek the help of friends to support himself while he worked on his mathematical discoveries and tried to get it noticed from accomplished mathematicians. Eventually an Indian mathematician, Ramachandra Rao, helped him get the post of a clerk at the Madras Port Trust. His life changed for the better in 1913 when he wrote to G. H. Hardy, an English mathematician. As a mathematician, Hardy was used to receiving prank letters from people claiming to have discovered something new in the field. Something about Ramanujan’s letter made him take a closer look and he and J. E. Littlewood, his collaborator, concluded that this one was different. The letter contained 120 statements on theorems related to the infinite series, improper integrals, continued fractions and the number theory. Hardy wrote back to Ramanujan and his acknowledgement changed everything for the young mathematician. He became a research scholar at the University of Madras earning almost double what his job as a clerk was paying him. However, Hardy wanted him to come over to England. Ramanujan worked with Hardy for five years. Hardy was astonished by the genius of the young mathematician and said that he had never met anyone like him. His years at England were very decisive. He gained recognition and fame. Cambridge University gave him a Bachelor of Science degree just for his research in 1916 and he was elected a Fellow of the Royal Society in 1918. Being a strict vegetarian and a religious person himself, the cultural differences and climatic conditions took a toll on his health. In 1917, he was hospitalized in a serious condition. His health improved in 1918 and he returned to India in 1919. However, his health problems got worse again and he died on April 26, 1920, in Chennai. Ramanujan did not offer any proof for most of his mathematical results, but other mathematicians have validated and proved many of them. Some were known earlier and a few were found to be wrong, but the vast majority have been tested and shown to be correct.